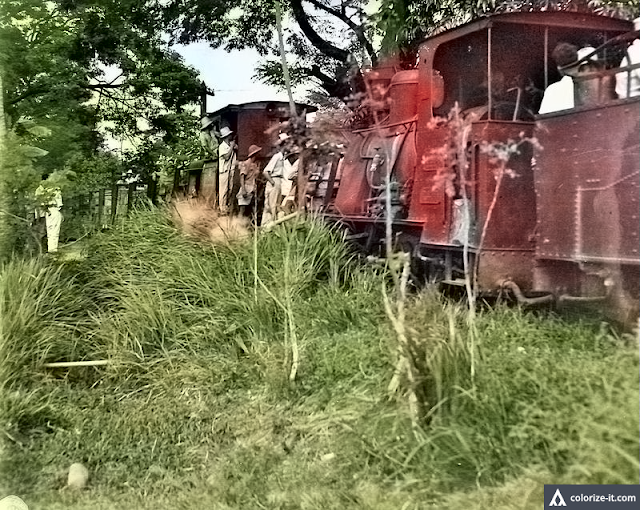 The photograph above shows a sugarcane train being prepared to carry ammunition to the war front in February 1945. Forces of the United States 8th Army landed on the beaches of Nasugbu on 31 January 1945. The landing was virtually unopposed, but rather than linger in Nasugbu to soak in the welcome of the locals, American troops pushed on ahead in pursuit of the Japanese without waiting for their equipment to be landed. Before long, troops of the 188th Infantry Regiment had captured the Central Azucarera Don Pedro at Barrio Lumbangan on the outskirts of Nasugbu. They found a usable train which was quickly put to use carrying supplies from the beaches. Either the train above was that train or one of several that the sugar central must have operated. The picture was downloaded from the United States National Archives, processed using graphics editing software to improve clarity and then colorized courtesy of Algorithmia. The picture was taken on 3 February 1945.